Can alcoholic beverages taste good, look good and be sustainable? Design agency Dragon Rouge's head of foresight and sustainability, Fiona Bennie, and director of consumer brand identity and packaging, Barbra Wright, believe they can. There’s no point making a product sustainable if it isn’t also desirable. People choose one product over another for many reasons - price, taste, aesthetics – but rarely is sustainability top of the list. For this reason is must be accompanied by stand-out design and branding. Along with many other categories, alcohol is feeling the pressure to tidy up their value chain; from sourcing, manufacturing, packaging, distribution and end of life. This pressure is reductive. It focuses on minimizing negatives. So much of the sustainability rhetoric of the alcohol category reflects this negativity. We have a more positive approach to sustainability. We spend a lot of time helping our clients to find solutions that highlight a clear customer benefit first and foremost, followed by the deeper story of sustainability delivered in a positive, desirable way. Design plays a substantial role in converting sustainability into desirability without a trace of worthiness – Method, the household and personal care brand do this in an impressively simple way. A lot of packaging innovation in the consumer goods sector remains highly incremental and limited to the format and design of the product itself. But packaging does not live only in distribution and on shelf. It lives in people’s homes and it ends up somewhere once they have finished with it. This may all sound obvious but it is rarely included in the scope of a packaging innovation brief, and therein lies a significant problem: if we consider packaging in isolation from the rest of the system we will only ever manage to create minimal impact both financially and sustainably. More forward-looking brands are considering the whole system they operate in. Partnering with their retail customers to trial take-back systems, for example. Or side-stepping the onerous and expensive council systems of glass recycling and investing in bottle-washing facilities which saves around 95% of CO2 according to Wine Bottle Renew, a Californian outfit servicing the local wine region. Taking a more holistic approach to packaging innovation is more complex and requires more investment, b ut will more than likely deliver significant wins in the long run. 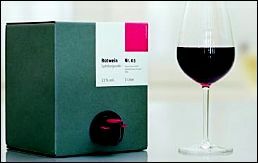 Hauswein is a German company specializing in bag-in-a-box wine, a niche market that is better known for cheap and cheerful quality than design than desirability. In contrast, they’ve created an iconic, simple pack (pictured above) that makes buying wine in bulk a genuine pleasure. 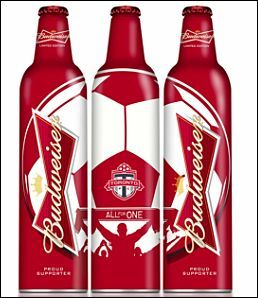 Budweiser teamed up with Toronto Football Club earlier this year to create an aluminum bottle to delight fans. 73% of aluminum is recycled globally. Canned beer is a more sustainable option than glass in many regions, but the glass format elevates the pack significantly – this combination of both creates an elegantly designed win-win (pictured above). 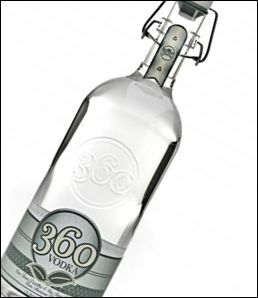 360 Vodka have created the first PET bottle with a swing-top closure (pictured above). This clever design retains a key asset from the original glass bottle, keeping the sophisticated shape even though the core material has changed significantly. Consumers get a lighter bottle with all the charm of its predecessor. And last but by no means lea st, this stunning beer bottle won the Dieline’s Package Design Award 2013. 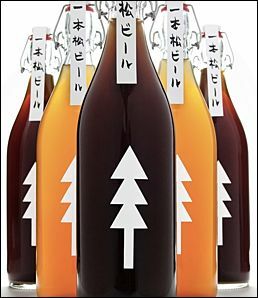 Named “Ippon Matsu”, which means one pine tree, the beer represents the only pine tree left after the 2011 tsunami. Before the disaster there were over 70,000. The tree had become a symbol of hope for the community and the beer was created to spread that hope and keep the plight of the local community alive. All profits are donated to the reconstruction efforts in Japan.